Fascination with the turbans worn by middle eastern sheiks (or sheikhs) must have been running high in the mid-1950s...either that or the influence of Rudolph Valentino (the iconic star of the 1921 Paramount film The Sheik), who died unexpectedly in 1925, had faded little after three decades. For R&B singer Chuck Willis (of "C.C. Rider" fame), the clothing accessory became a fashion statement, an everlasting trademark for the also-ill-fated star. There were lesser-known music artists who donned the typically bejeweled headgear, including three vocal groups that not only wore them while performing, but used the term "turbans" as all or part of their names. Indianapolis was home to The Five Turbans, a baritone-heavy vocal outfit with Bobby Bernard, Hilton Hudson, Clarence Dorsey, Tony Goodrich and bass Herman Lewis; formed in 1953, their look was completely in sync with the name. They sang at many local night spots including George's Bar and Orchid Room, owned by Leo Lesser, who recorded them for his own label, Deb. 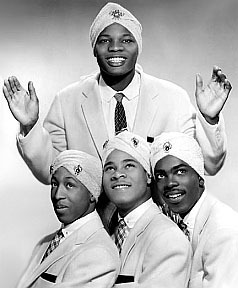 A 1954 seasonal release, "Christmas Prayer," was the quintet's only single credited to Five Turbans. Later they took a new name, The Monograms, and worked for many years in various lineup configurations featuring lead singer Bernard; "Please Baby Please" appeared on the Saga label in 1957. 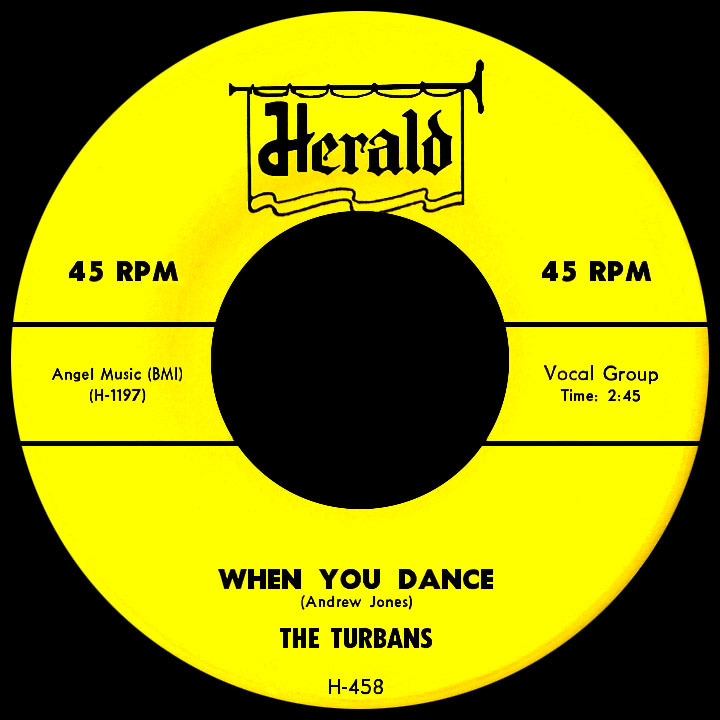 A Los Angeles-based group called The Turbans were shorter-lived but a bit more successful (and yes, they wore the headdress). John Dolphin, owner of the Dolphin's of Hollywood record store, owned a few separate-but-connected record labels; in the spring of 1955 he issued the first of three singles by the L.A. Turbans on his Money imprint, "No No Cherry" (a double entendre combining dessert and matters of the flesh) backed with "Tick Tock A-Woo." The five-man act was led by Harry Caesar, who as Little Caesar had scored a hit in 1952 on another of Dolphin's record labels, Recorded in Hollywood; the somewhat shocking "Goodbye Baby" finishes with the singer shooting his ex-lover and then turning the gun on himself. Tenors Al Williams and Burl Carpenter, baritone Willie Roland and bass Andre Goodwin rounded out the roster. The same year they had a single (the ballad "Made to Love") as The Sharp Tones on Post, a label distributed by Imperial Records. Little Caesar made further solo recordings after the quintet's demise and began an acting career in 1969 with an appearance on the NBC sitcom Julia starring Diahann Carroll. Over the next 25 years, Harry Caesar made dozens of appearances on TV series (mostly police and crime shows) while occasionally working in feature films. 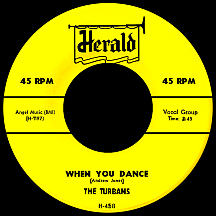 Then we have The Turbans that are remembered for their big 1955 hit "When You Dance." Al Banks led the Philadelphia foursome assembled around 1953 with tenor Matthew Platt, baritone Charlie Williams and bass Andrew "Chet" Jones. Al Silver of Herald Records in New York took a chance in 1955, banking on "Let Me Show You (Around My Heart)," with Al's exquisite high tenor vocal, to put them on the charts. But the population apparently preferred to dance, particularly to songs with a hint of the Latin beat that was so trendy in the mid-'50s...and the single's B side, "When You Dance," filled the bill. The harmonies were tight, the lyrics simple and undeniable: '...be sure to hold her, hold her ti-ight...when you dance, you'll squeeze her, yeah, with all your might...such a thrill, oh, when she's close to you...well, hold her tight...' and then that line from bassman Andrew Jones (the song's composer): 'When you dance'...what else? The single peaked in the top 40 during a five-month up-and-down run from October 1955 through March 1956. This one and, unfortunately, only big hit kept the Turbans (some members wearing two gems in their headwraps, others wearing just one) on the road for much of 1956 and '57 as part of some of the the biggest shows, headlined by the likes of Bill Haley and his Comets, Fats Domino, The Platters, The Drifters, Ruth Brown, Little Richard, LaVern Baker and, like themselves, the many hitmaking doo wop acts of the era. The follow-up disc, "Sister Sookey," vigorously asked where the title gal had '...done gone' (answer: '...she's gone to Egypt!') and was a crowd-pleaser in concert but floundered in its quest to accumulate radio airplay. The problem persisted with successive efforts, "B-I-N-G-O" (lyrics mostly consisting of gameplay calls: 'B-21, N-19...'), the fast-paced and vocally tricky "Bye and Bye" and new dance "The Wadda-Do" (featuring a conspicuous "When You Dance" wood block effect). The group departed the halls of Herald in early 1958. After one single for Red Top (slow-burn ballad "I Promise You Love" with all members harmonizing the lead), they went missing on record for about two years but continued performing. Roulette Records picked them up for a pair of singles, the first a summer 1960 cover of "Diamonds and Pearls," which was a major hit for Bakersfield, California doo woppers The Paradons on Milestone. Members began to stray while new singers were added, including Earl Worsham, John "Pancho" Christian and, later, Reggie "Tootie" Price (they had all sung with The Quadrells, also known as Cameo Records group The Cameos). In the spring of '61 the Turbans remade "When You Dance" for Cameo's sister label Parkway and it briefly made the "Bubbling Under" charts; its nice semi-acoustic-with-strings arrangement makes for an interesting comparison to the more assertive original. member shuffling resulted in the addition of Sonny Gordon and a new bass, "Cisco" Williams (making them a quintet for a time). A stint with Imperial in '61 and '62 resulted in three Turbans singles; "Six Questions" (oh, the pressure of trying to answer that fifth one: 'Do you believe that our love was destined to be?') was followed by "This is My Story" (remaking a 1955 Gene and Eunice hit that had recently been revived by Mickey and Sylvia) and "I Wonder (I Wanna Know)." These tracks retained the strong vocal impact and production values of early efforts. The group made no more records after leaving Imperial but continued doing shows for a few years with Al Banks heading a rotating lineup. Banks died in 1977; if he had lived longer, perhaps The Turbans would have reappeared in some form (wearing their signature sheik-inspired head coverings, of course) as part of the oldies revival that kept many a doo wop act going strong during the 1980s, '90s and beyond.